There are considerable differences between bacterial and mammalian glycans. In contrast to most eukaryotic carbohydrates, bacterial glycans are often composed of repeating units with diverse functions ranging from structural reinforcement to adhesion, colonization and camouflage. Since bacterial glycans are typically displayed at the cell surface, they can interact with the environment and, therefore, have significant biomedical importance. 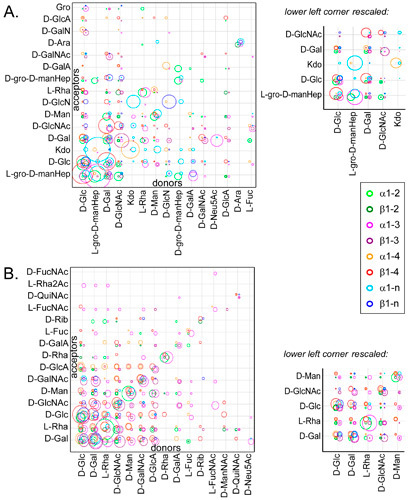 The sequence characteristics of glycans (monosaccharide composition, modifications, and linkage patterns) for the higher bacterial taxonomic classes have been examined and compared with the data for mammals, with both similarities and unique features becoming evident. 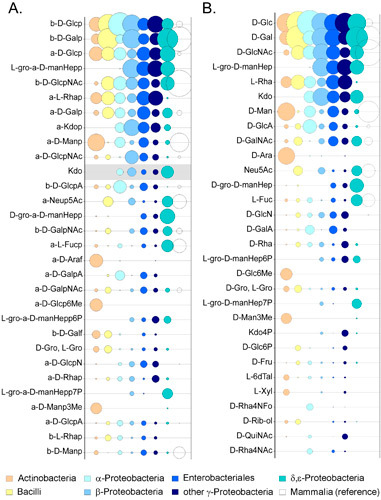 Compared to mammalian glycans, the bacterial glycans deposited in the current databases have a more than ten-fold greater diversity at the monosaccharide level, and the disaccharide pattern space is approximately nine times larger. Specific bacterial subclasses exhibit characteristic glycans which can be distinguished on the basis of distinctive structural features or sequence properties. 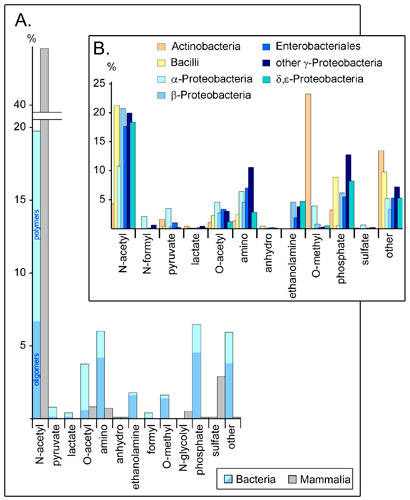 For the first time a systematic database analysis of the bacterial glycome has been performed. This study summarizes the current knowledge of bacterial glycan architecture and diversity and reveals putative targets for the rational design and development of therapeutic intervention strategies by comparing bacterial and mammalian glycans.